It was a whirlwind 48 hours, not with Eddie Murphy but with Mexico’s greatest fighter ever, the incomparable Julio Cesar Chavez at his homeland in Culiacan, a city in northwestern Mexico. Julio is an all time great, a master in the ring, a hall of famer, a true legend in boxing and, most importantly, a hero to his people in Mexico. Julio Cesar Chavez was being honored by the Culiacan people with a huge, 11½ ft. raised statue of him placed in one of the city’s most visited areas. Celebrities and thousands of fans joined the festivities and we were there. My producer Jon and I were invited to attend the ceremonies by the WBC’s Mauricio Suliaman and all of boxing royalty was there including friends and former champs Juan LaPorte, Jessie James Leija, and boxing great Ruben Castillo and many others. It was a media frenzy with journalists from around the world and five Spanish News Teams including Azteca TV, ESPN Deportes, Telemundo and Golden Boy TV. Oscar Dela Hoya would show up soon, too. Hall of fame referee Richard Steele traveled with us from Las Vegas. 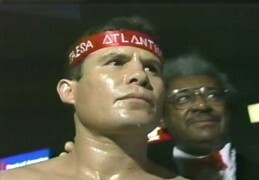 For many of Chavez’s fights, Richard was the third man in the ring. He was there for Julio’s legendary wins over Hector Camacho, Greg Haugen (before 132,000 people in the Mexico City bull ring) and the dramatic and controversial fight with Meldrick Taylor, when Richard stepped in with just seconds remaining to give Julio a come from behind miraculous win. Taylor was just three seconds away from becoming the first guy to beat Chavez who was 68-0 at the time in 1990. A highlight of the trip was visiting a home that Julio used to own. One of the reasons Chavez is revered by his people is that he gives back. Julio donated his beautiful home so that it could become a drug addiction center helping thousands addicts overcome their dependency. Chavez knows the struggle and the subject is very close to home with Julio being clean but always recovering himself. Of all the entertainment, political and sports stars from Mexico, like Coach Miguel Herrera from the Mexican national soccer team that were on hand, one guy stood out, Julio’s promoter all those years Don King, “Mr. Only in America”. But the day belonged to the champ, Julio Cesar Chavez and as ring announcer, Jimmy Lennon handled some of the honors we showed our respect to this great fighter. This is a man who fought for twenty five years, had 115 fights and was 87-0 before fighting a draw with Pernell Whitaker in 1993. His first official loss was the following year to Frankie Randall. It is highly unlikely that Chevez’s records will ever be duplicated or broken. He is an amazing fighter who finished his career with 107 wins and only 6 defeats and 2 draws. This was an unbelievable journey to Mexico to witness what true greatness looks like. Plus it was my birthday. It doesn’t get better than that! In This Corner with James Smith is starting its 11th year in national syndication with 60 episodes of the greatest fighters, past and present. Check out pre and post fight coverage of major events and interviews with the boxers in the ring at InThisCornerTV.com. Download the Fight Night boxing app for up to date news and to score the major fights.